Hilltop House is a 1920's manor house on a hillside above the Nolichucky River Valley, with the Appalachian Mountains in the background. All the guest rooms, which are furnished in antiques and period reproductions, have mountain views; two have verandas. In keeping with her British birth, the innkeeper sets out a proper English tea every afternoon. The family breakfast consists of fruit, cereal, egg dishes, and homemade biscuits or muffins. Then it's time to explore. White-water rafting, hiking, biking, trout fishing, golfing, hunting, and bird-watching are among your options. Cherokee National Forest is within striking distance of the bed and breakfast, as are the Great Smoky Mountains and the Blue Ridge Parkway. 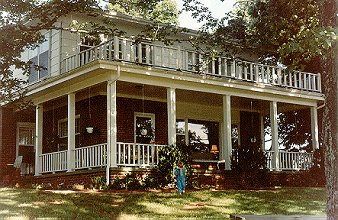 This and other Greeneville Bed and Breakfast Inns can be found here in The Register.